As the mobile market increasingly moves toward in-app purchases as a key monetization tool, developers often question how to extract revenue from users without being too aggressive or manipulative. New data from app analytics firm Localytics suggests the best way to make in-app purchase pay is to build loyalty and engagement, which can result in more revenue overall than a quick sell. 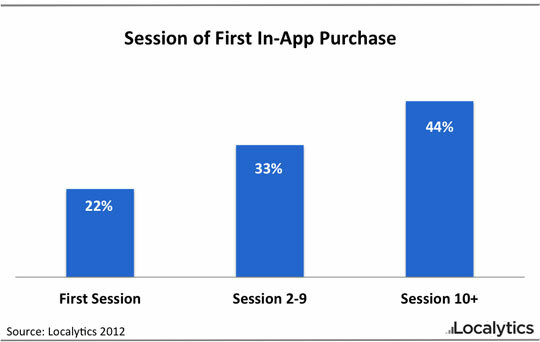 Localytics, which analyzed about 30 million users’ in-app purchases, finds that those who conduct an in-app transaction on their first session make an average of 2.8 total purchases. 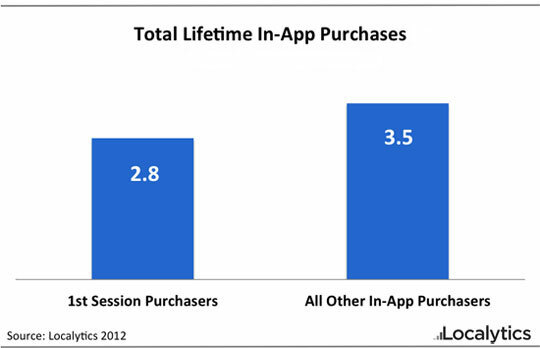 But all other users ultimately make 3.5 purchases throughout the course of their use with an app. Now, some of this is intuitive considering that Localytics previously reported that 26 percent of app users abandon an app after one try. Developers can better monetize a user who sticks around then one who leaves. But the figures make the case that it’s better to focus on engagement first and build a good relationship with a user before trying to hit them up with an in-app purchase offer. Localytics said only 22 percent make a purchase on their first session while 33 percent do so between two and nine sessions. And 44 percent make their first purchase after 10 or more sessions. And users take an average of 12 days between the time they download an app and make their first purchase, said Localytics. Getting some money early might seem appealing given how fickle users are and how much competition there is, but Localytics found that only 16 percent of users who made a purchase during their first app session will go on to engage with that app 10 or more times, compared to 26 percent of all app users. The idea seems to be that it’s more important to establish loyalty first and get people hooked on an app before hitting them up to buy virtual currencies or paying for a premium service. The fact that users often take their time before making a purchase means developers should think about how engaging their app is over weeks and months, not days. Some may still just want a quick pay off, but building a relationship with users can ultimately be more lucrative. This makes logical sense. The challenge, however, is how to build that loyalty and transfer it to in-apphttp://s1.wp.com/wp-content/themes/vip/gigaom/img/submit.png?m=1307725281g purchases.